For nearly seven years, my husband and I have been preparing ourselves and our sailboat, Penelope, to join a unique population of sailing nomads and pursue our dream of “blue water cruising” – sailing across vast oceans to exotic places and warmer climates. 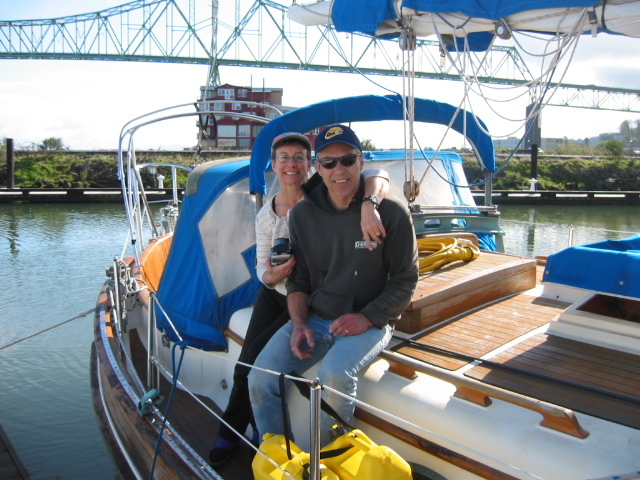 The initial phase of our adventure began in the spring of 2007 when Peter and I moved aboard. Once the purchase was final and the ocean was calm enough, Penelope was delivered from Anacortes to the West Boat Basin in Astoria, Oregon. She waited there for her new owners. Peter and I had our friend, Mike, drive us to Astoria on a Friday evening in early April. When we arrived at the marina it was raining the way it rains in Oregon in the spring. The drops were as big as quarters. We had to carry our sleeping bags, warm clothing and other provisions from the parking lot, down the steep ramp to the boats and down a long wooden dock to the slip. We trudged through the darkness, straining against the wind and rain until we located our new home moored at the far end of the marina. Using a flashlight, we removed the padlock and pushed back the hatch over the companionway. It was as dark as a dungeon inside. We turned on the lights and made our way below. Our wet outer gear got everything inside the boat wet, too. I started to look around. The boat seemed so much smaller than I remembered it. I adjusted the thermostat on the wall to turn on the furnace but nothing happened. Peter tried several times to trouble shoot the problem but was unable to make it generate heat. It felt like being in a deep freeze. Peter and Mike sat at the table, drinking a beer, to celebrate our new purchase. I was mortified. What had I done? I realized I had just handed over tens of thousands of dollars with the intent of making my home aboard this tiny, wet and cold sailing vessel. I cried myself to sleep. Aside | This entry was posted in Getting Ready and tagged astoria, Penelope, susan gierga. Bookmark the permalink. Despite the ending of your opening post, I think you made the best purchase of your life! One that will give you freedom on the water; to explore and really live! See you soon! I’m looking forward to receiving your posts. Susan, you’re off! Congratulations! I will be checking your blog regularly to see where the wind takes you. Best of luck to you and Peter. Randy and I look forward to following you on this amazing adventure Pete! Wishing you and your wife safe travels as you explore the world aboard your beautiful Penelope.